Valentine’s Day is coming! I think I like it better now that I’m older. It’s so much more fun with kids. No worrying about the romance or dates or whether anyone’s bringing you flowers. Just fun celebrations of love in all its forms. Valentine’s Day is one of those holidays that seems to lend itself — more than most — to crafty things and DIY-ing and being creative, too. Wouldn’t most of us rather have an imperfect valentine made by someone we love, than something outlandish and expensive that’s not really heartfelt? I think this is a sign I’m getting old. 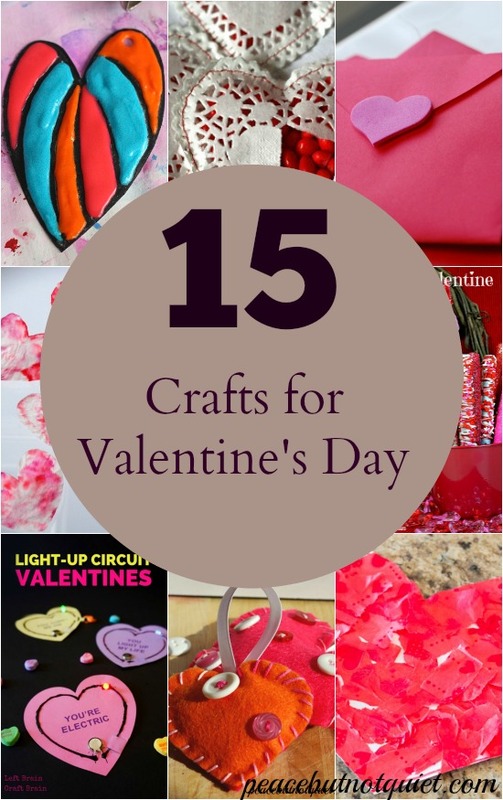 So I’ve scoured blogs and posts and other ideas and come up with 15 of the most creative, cute, heart-warming Valentines Day crafts for this season. Try one with someone you love today! 1.) 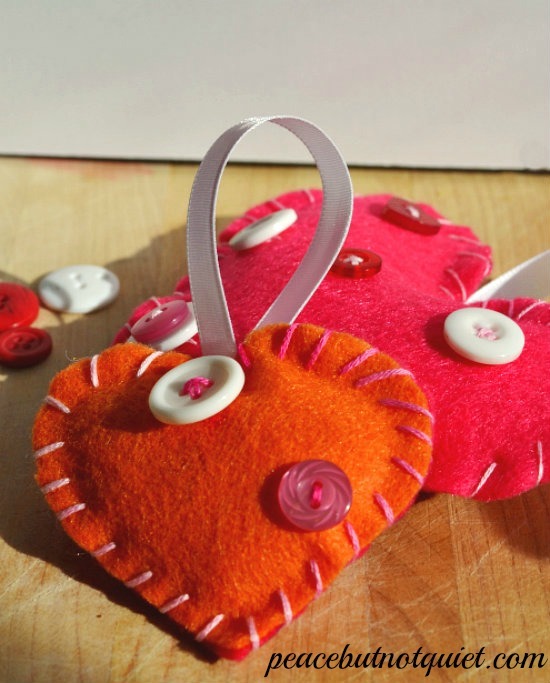 Felt Button Hearts — these felt button hearts are an easy, adorable project for kids just learning how to sew. Use them to top presents, as ornaments, or just give one to someone you love! 2.) Salt Dough Heart Footprints — such a sweet way to preserve tiny baby feet, and a wonderful idea for a new mom or dad from Red Ted Art. 3.) Tissue Paper Hearts — and for slightly older kids (toddlers and preschoolers), try making tissue paper hearts from Love Play and Learn (and build their fine motor skills at the same time!). 4.) 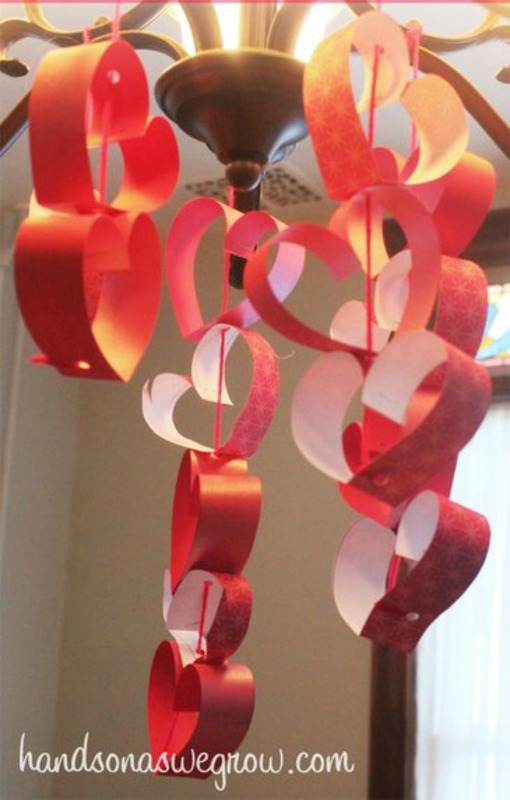 Heart Chandelier — this heart chandelier from Hands on As We Go lets kids get involved decorating around the house as well. Or you could turn them sideways and use them as garlands, too! 5.) All-in-One Heart Envelope — it’s a valentine…it’s an envelope…it’s everything you need all at once! Tinkerlab’s all-in-one heart envelope is creative fun for kids. 6.) Puffy Paint Valentine Cards — use homemade puffy paint from Happy Hooligans to decorate cards for your valentines this year! 7.) 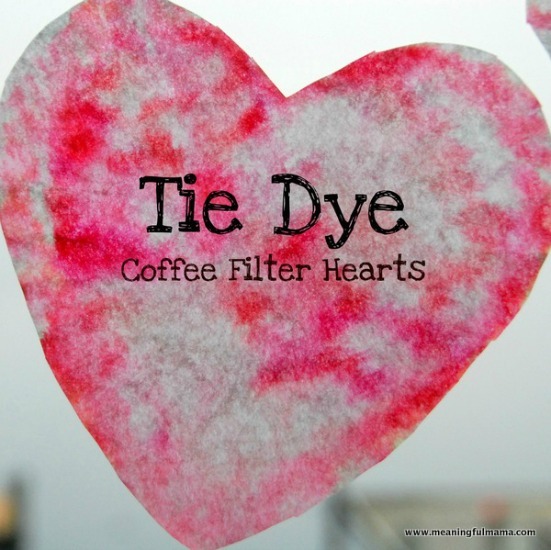 Tie Dye Coffee Filter Hearts — these tie dyed hearts from Meaningful Mama are another fun decoration. 8.) Valentine Boxes — once you have all your valentines, you need somewhere to put them! Try these ideas from Paige’s Party Ideas for decorating valentine mailboxes. 9.) Light-Up Valentines — this is one of my favorite crafts ever! 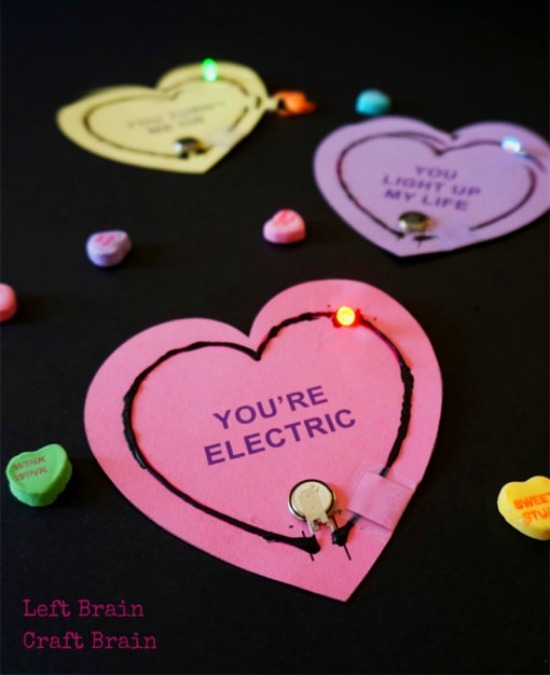 Make valentines from Left Brain Craft Brain that actually light up! How cool is that?! You can work in some science and explain how it all works, too, if you want. 10.) 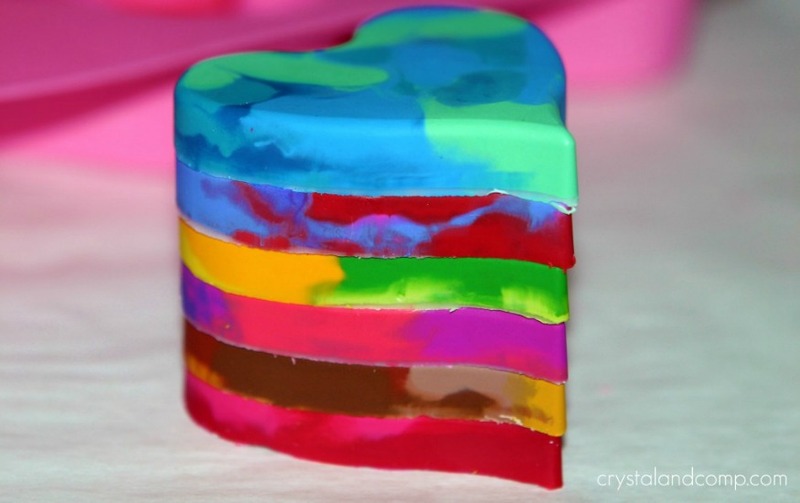 Heart Crayons — Use up your old, broken crayons and make cute, heart-shaped ones. Crystal & Co shows you how to make heart crayons…and package them up as sweet gifts for friends as well. 11.) Natural Valentine’s Day Crafts — don’t forget our outdoor friends! By the time February rolls around, the birds and other outdoor creatures can certainly use a little treat. Try these ideas from No Time for Flashcards. 12.) 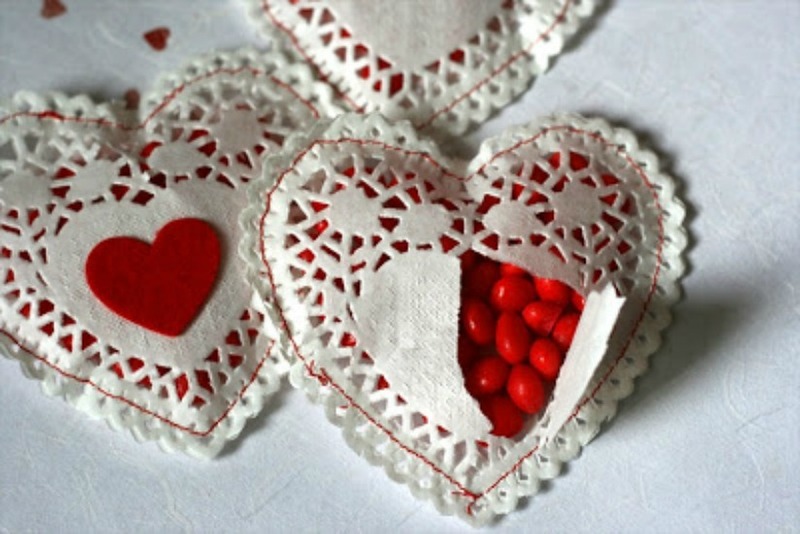 Doily Heart Candy Favors — what a fun way to serve candy! This is another easy sewing project from Chic Tags and one I think older kids can handle easily. 13.) Valentine Pretzels — the nice thing about decorating pretzel sticks is that you can get as fancy (or not) as you want. Grab a ton of different sprinkles and toppers, or just stick to one and have a great time! Check out The Lady Behind the Curtain for more ideas to decorate them. 14.) Heart Crispy Pops — Make these rice krispy heart-shaped pops for a school party or dessert at home! From The Nurture Store. 15.) Heart Animals — Lots of ideas on Crafty Morning on how to make all kinds of animals from hearts. I’d make some and then read My Heart is Like a Zoo to finish things up. So many crafts — so many ways to spend time with those you love! Happy Valentine’s Day!